Solve problems in chemistry using dimensional analysis. Select appropriate tiles so that units in the question are converted into units of the answer. Tiles can be flipped, and answers can be calculated once the appropriate unit conversions have been applied. The handout for the stoichiometry gizmo was well written. This version simply has a pre-test & post-test... (more) section added for the vocabulary. It also has a few feedback questions added to the end. Excellent Practice students get immediate feedback & visual setup of problems. 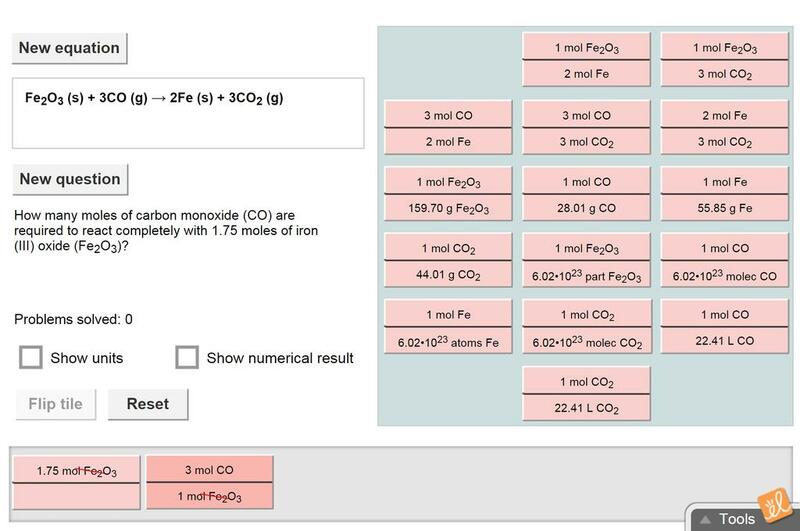 A very visual scaffold for assisting students understand dimesional analysis, cancellation of units in stoichiometry. What a great addition to my lesson. This is a good way for students to visualize the steps in solving stoichiometry problems. a good trial and error method of unit analysis. I used this as an intro to the numerical stoichiometry; I did the first one for the class.